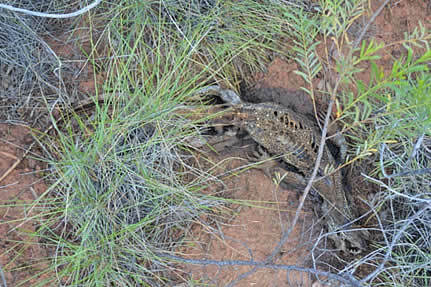 Three yellow-spotted monitors were found dead less than a week after toad arrival at the Marella Gorge, Nicholson Station study site of the ongoing biodiversity survey conducted by the Kimberley Toad Busters’ researcher Jordy Groffen. Jordy Groffen, Animal Scientist commented. “When I first began the KTB research project at Marella Gorge in October 2013 toads were 10 km away from the study area. In normal circumstances toads travel an average of 50-55 km per year, and as expected toads arrived at the study site in February 2014”. Another find by KTB was that within a month of the cane toad’s arrival atThe aim of the research conducted by KTB is to determine the short term (5 month) effect of the cane toad invasion on the amphibian, fish, bird, mammal and reptile populations in Marella Gorge, Nicholson station WA. the gorge system, breeding has started. Hundreds of cane toad metamorphs (small toads, just after the tadpole stage) were found hopping around. 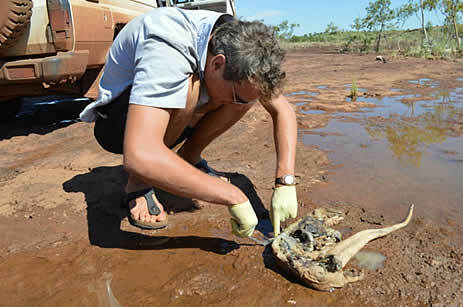 Jordy said: “This is a devastating find for native wildlife. Besides the fact that toad numbers will quickly rise, these small toads will mean th The dead monitors were dissected right after they were found. Jordy commented that “the large adult monitors did not show any signs of trauma or injury, so the deaths are likely due to cane toad mouthing or consumption. However, the goannas were too putrescent to find any sign of toads. Short term impact of cane toads on the native wildlife in Marella Gorge already seems to be massive”. 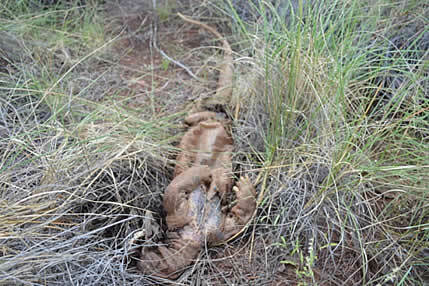 The study will continue until august and after that, population numbers of native wildlife before and after cane toad arrival will be compared. 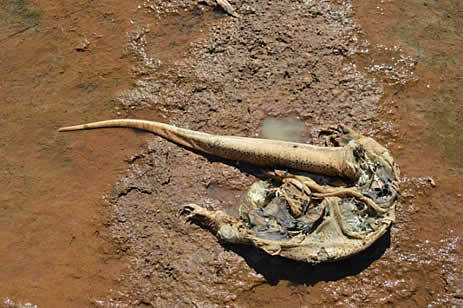 at more and smaller animals will now be susceptible victims of cane toad poison” Jordy went on to say that “nobody expected that breeding would start so quickly after arrival at the gorge, confirming that this could mean that short term impact will be even greater than expected”. KTB President and founder stated. “There has been much negative discourse from a prominent scientist and our state government about community efforts mitigating impacts on native biodiversity by keeping toad numbers under control. Marella Gorge has had a focused and comprehensive survey of its native wildlife and is now the ‘sacrificial lamb’ so to speak. Clearly we are already seeing what difference uncontrolled numbers of toads and their breeding have on our native wildlife”. Lee went on to say “Kimberley Toad Busters have always maintained that by community involvement in controlling cane toad population numbers in a given area you minimize the chance of native predators attacking and consuming a toad, which in turn reduces the number of native animals dying as a the direct impact of the cane toad. Keeping toad numbers (adult and all breeding cycles) under control also helps the smaller insect eating native predators such as frogs, smaller skinks and lizards by reducing food competition”.